Preparing a delicious Flank Steak is easy on a camping trip. Flank Steaks are a less common cut than some other cuts of steak. I first became familiar with this cut when I was travelling around South America a few years ago. This cut comes from the muscles surrounding the cow’s abdomen. This cut of meat is generally 12 inches (30 cm) long, 6 inches (15 cm) wide but rarely more than 1 inch (2.5 cm) thick. Generally the meat is very dark red in color. It’s a larger piece of meat so you will be able to get several meals out of one package. 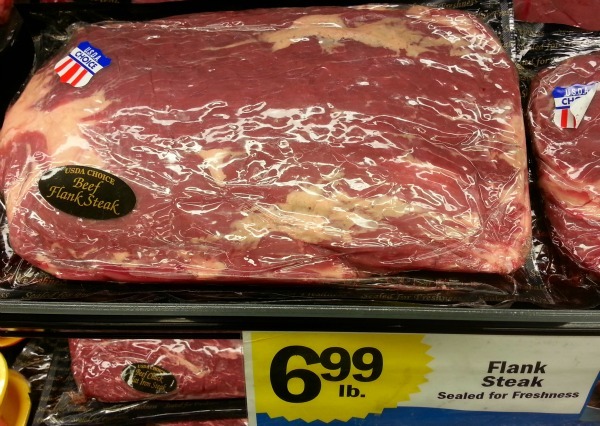 An illustration showing the Flank Steak packaging and price. There are many different ways you can prepare this meat. It can be grilled, broiled, sliced up for stir-fry or just fried up in a pan. At times I’ll even braise it for extra tenderness. For the sake of this particular recipe we’ll slice it up for stir-fry. The most important part of preparing a Flank Steak is to cut against the grain when you serve it. Same applies if you pre-cut the meat for stir-fry. It’s a lean cut of meat. In Kroger Stores it usually comes in a vacuum sealed package…so it will last longer in the camping cooler and won’t make a mess as easily as other packages. The price at $6.99USD per pound, is substantially less than other more common cuts. With this particular cut of meat here are a number of various meals you can prepare..
And, just because it's less expensive doesn't mean it's tough to chew. A couple different ways to prepare a Flank Steak. Once I open the vacuum sealed package I like to make the entire piece of meat so that it won’t spoil as fast. Slice up one one-third of the cut into thin slices for stir-fry. Take another third and leave as a solid piece. Thoroughly cook this piece until it is well done, let it cool and use as a sandwich meat the next day. Cook up the last third to medium done or however you like it. Eat it while topped with pan-fried mushrooms or peppers with onions. Or, if you prefer, save it for later and eat as a leftover meal. Can’t find a Flank Steak at your Supermarket? This particular cut of meat is generally vacuum packed. At least that is the only way I’ve seen it packaged. You’ll most likely be able to find it along side with organic ground beef, ground bison, leg of lamb and other various cuts of lamb. Download your free printable copy of Outdoor Flank Steak Stir-fry over Rice PDF here. 2 tbsp – chopped red pepper (or, green pepper) or add a little jalapeno for a bit of kick. Lawry’s Seasoning Salt or be creative with a little extra dash of this and a dash of that. A little bit of olive oil poured over any type salad with a dash of salt is simple to prepare and refreshingly delicious with dinner. For the pan use olive oil. 2 - Season both sides of the steak with a little Lawry’s Seasoning Salt. 3 - Toss in the sliced up meat into the pan and spread around with a spatula. Use high heat for a short period of time to sear the meat, then lower heat to medium. Sometimes I’ll add some olive oil after I initially seared the meat. Once the meat is seared, put some olive oil in “Teflon” frying pan with the meat. Note: Never let the olive oil get so hot in a pan that it smokes! That’s very unhealthy! 4 - Add all the extras: onion, ginger, garlic, bean sprouts, red pepper & finely split broccoli and cauliflower to the pan. Mix all the contents. 5 - Reduce the heat to low and cover with a lid. 6 – After (5) minutes, stir contents around with the spatula. 8 – After another (10) minutes everything should be done. 9 - Stir around the Flank Steak Stir-fry with the spatula until everything is mixed. 10 - The broccoli and cauliflower should be hot but still crisp when serving. 11 – Cut open the bag of rice and serve on a plate. Serve the Stir-fry over the rice and enjoy! You’ll find a Flank Steak to be a reasonably priced healthy cut of meat. Give it a try and enjoy! Return to the camping recipes page for information on what to buy for your camping trip. And, go here if you need to get back to the home page. Another favorite, prepare a mouth watering meal from this how to cook salmon recipe page. Prepare... Mean Hot Ground Buffalo Recipe with Rice in 8 easy steps in less than 15 minutes. Discover how to cook steak, the perfect steak, at your campsite.